Hello, crafty friends, and welcome to Little Woolly Things! I have been knitting my little fingers to the bone, so I have some new things to show you. And I’m also working on a very scary project, too, that I’m not ready to unveil yet. I will tell you about it, but it’s not ready for public viewing quite yet. So, the first thing I want to show off is the WIP that has been getting most of my attention for the last few weeks. I am working on this Summer top design as my contribution to a knitalong in one of my Ravelry groups. The KAL started May 1st and is open until July 31st, so I’m not into that end of the KAL, deadline is approaching crunch yet, but I’m really trying to avoid pulling an all-nighter to finish a project that I got myself involved with just because I thought it sounded like fun. At my age, pulling all-nighters is just not fun anymore. I would really like this project to continue to be fun all the way through, so I’m working on it diligently now, in the hopes of finishing it before the deadline. We shall see how that all works out. It started like this, with a little swatch. I turned that little swatch into a square neck yoke, and then I had to decide how to handle the sleeves working from the top down. I’m pretty sure I changed my mind about fifteen times. Then, I picked out a lace pattern to add some extra interest to the design, picked up stitches along the edge and started knitting. Easy, right? And then, I sat up last night to do some more knitting after the kiddos were in bed and thought, “Hey, why don’t I watch Gone with the Wind while I’m knitting. I don’t remember ever watching it before and it’s a classic that I should probably be familiar with.” Or something like that. So, I started watching this wonderful old movie. I did not realize how incredibly long Gone with the Wind is! Have you seen it? Do you realize that it’s nearly FOUR HOURS LONG??? I did not stay up long enough to watch all four hours of it. You might suggest that I could have forwarded through the overture, intermission and entr’acte music, but as a musician, I just can’t bring myself to do that. I love the music and I want to hear it as much as I want to see the movie. So, to sum it all up, I know what I will be knitting to for the next couple of nights. And isn’t Rhett Butler just a cad? And Scarlett? Absolutely scandalous. So, that’s where I am on the Summer top project. I have another project to show off, and this one is actually a finished pattern, ready to be your next project. It’s a quick, easy knit, with some simple embroidery to top it off. I call it the Cornflower Cowl. Ravelry users can purchase the pattern here. And if you’re not a Ravelry member, you definitely should be. This website has everything knitting, crocheting, spinning, weaving and otherwise yarn related. And while you’re there, check out my Ravelry store. I have also begun to venture into the YouTube world, of late. I recorded one knitting tutorial video and uploaded it for all the world to see. I am planning to record more tutorials soon, so subscribe to my channel: Little Woolly Things, and watch my one tutorial video on how to work the linen stitch. YouTube will notify you when I upload the next video, so you can watch whenever you have the time and want to work on a new knitting technique. I also receive email notifications whenever you leave a comment on one of my videos, so if you like it, let me know in the comments right there on YouTube. If you have a suggestion for a tutorial that you would like to see, please share that, too. I will try my best. And that leads me right into the big, scary project that I am putting together. 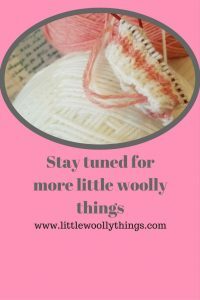 I have been working on a Little Woolly Things podcast. I actually recorded “Episode 1” but decided to use that experience as a dress rehearsal for my next attempt. Let me tell you, talking about your knitting projects to your videocamera for any length of time is not as easy as so many podcasters make it appear. Did you notice my cheery greeting at the beginning of this post? I’m working on that. I think it will take a few episodes for me to work out my podcast format and remember to breathe normally in front of the camera. I am hoping to talk about more than just knitting and crochet in this podcast. I would tell you all about it, but then you wouldn’t need to watch it. SO, I will leave you wondering just a little bit and hope that you will watch my podcast when I finally release Episode 1. It will be worth the wait. So, that’s the news from Bravewood. Be brave, friends, and have a wonder-filled day! Little Woolly Things Podcast on YouTube! You are going to be great. I can’t wait to see it. * Start the same as for a photo – take a deep breathe and hold it for the first 3-5 secs of recording. This will not only prevent blinking in the opening, but it gives an appearance of steady and together in your opening and gives you enough recording to trim at the end for a more polished video. * Start your speaking the same as you would singing. – Aim for the second or third word in. That way you’ll have plenty volume on the first syllable of the first word, without it sounding shouted or unnatural. If all else fails and your nervous, eat a banana. So sorry, that should’ve been ‘you’re’, not ‘your’ – not enough tea this morning.